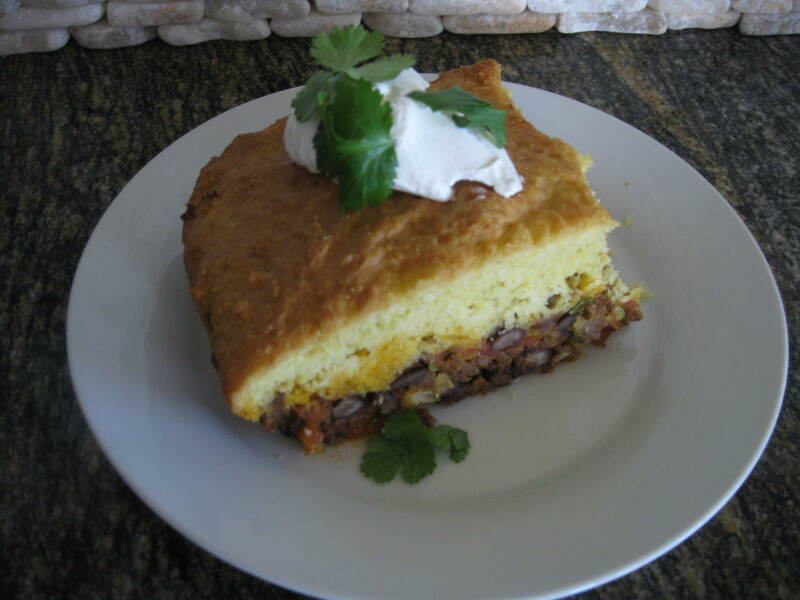 I’ve tried a few versions of this recipe, but this one gets the proportions right between the cornbread topping and the meat mixture on the bottom. I hope you enjoy! Heat the oil in a frying pan, and brown ground beef. Then add onions and jalapenos. When they are browned slightly, add chili powder, garlic, tomato paste, oregano, cumin, and cayenne and cook until mixed together and fragrant. Stir in diced tomatoes with the juice from the can, and scrape up all the browned bits off the bottom. Take away from the heat and stir in the black beans, corn, cheeses, cilantro, and lime juice. Season with salt and pepper. Then dump the mixture into a greased 9×13 pan. Whisk the flour, cornmeal, sugar, baking powder, salt, and baking soda together in a large bowl. In a separate bowl, whisk the buttermilk, butter, and eggs together. Stir the buttermilk mixture into dry mixture until it is well incorporated. Pour over the top of the meat mixture an bake in a 375 degree, preheated oven until the filling is bubbly and the top is golden brown, 50-60 minutes. Top with sour cream, fresh cilantro, and lime wedges. Made the beef tamale pie tonight. Really good! Didn’t have jalapenos so I used tomatoes with chipotle peppers. Used corn bread mix for the top. Yummy! So glad you tried it! The tomatoes with chipotle peppers would be fun to try sometime….I’ve seen versions where they used chipotle with a straight veggie mix on bottom. I bet the smoky flavor is good with the cornbread!